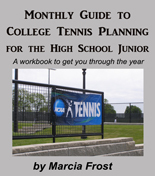 The USTA once again put some of its top juniors against current college players. It was quite a showing for American youth. In the first match, the girls team of Breanna Addison, Lauren Davis, Lauren Herring, Kyle McPhillips, Grace Min, Monica Turewicz and Chanelle Van Nguyen shut out the University of Alabama women. 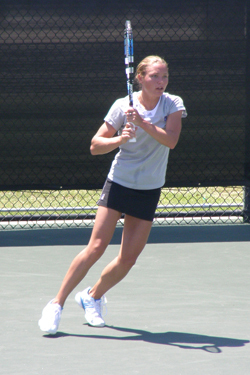 At Georgia, only the doubles team of Nadja Gilchrist & Chelsey Gullickson managed to win a match (the juniors took all the singles). In the final exhibition at Georgia Tech, the singles were split between the two teams, with Irina Falconi and Lindsay Blau handing Lauren Davis and Kyle McPhillips their first losses, but the juniors took both doubles for the overall win. 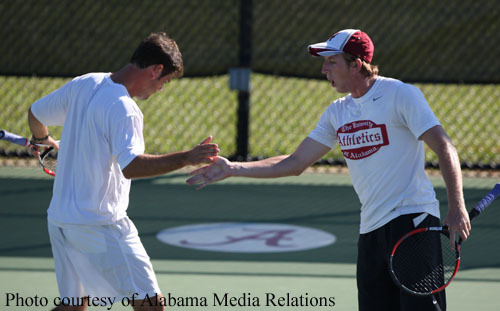 It was a good weekend for host team Alabama as they picked up two of the titles at the Crimson Tide Fall Invitational. Michael Thompson won the championship in the Stabler draw over Adam Berstein of Tulane. Creighton Blanchard needed three sets to take the Musso bracket, defeating Mario Gutierrez of Tennessee Tech. Vanderbilt's Creighton & Mike Davis also took the White Draw doubles. Vanderbilt's Charlie Jones and Adam Baker upset the nation's top duo -- John Patrick Smith & Davey Sandgren of Tennessee for the Crimson Draw doubles. Texas A&M's Sheri Olivier & Nazari Urbina captured the doubles championship at the HEB Baylor Invitational at Baylor. At the Rebel Classic, the following players prevailed n the finals: Flight One Singles-Andre Dome , Cal Poly, Doubles-Andre Dome & Jordan Bridge, Cal Poly; and Flight Two Singles-Fernando Ristov, UOP. The University of Memphis and the Racquet Club of Memphis reached an agreement to make the club the official home for the men's and women's tennis programs. Former TCU standout Macall Harkins earned her first professional singles championship, claiming the 2009 Mexico City $10,0000. The 15th Annual Smrikva Bowl will be held again in Pula, Croatia, from June 22-27, 2010. This event features the top 10 and under players from around the world. The "Little Mo"/Smrikva Bowl will also be held in conjunction with the event, on June 27th. This is will be the 9th year of this exhibition between the Smrikva Bowl winners and top "Little Mo" players will take place. For more information on the Smrikva Bowl, visit http://www.smrikve.com/smrikva-bowl. Samford players Stephanie Parkison & Madelie Janse Van Rensburg teamed to win the doubles at the 2009 North Florida Invitational. The USTA announced a three-year sponsorship agreement with the ITA to become title sponsor of the USTA/ITA National Intercollegiate Indoor Championships, the USTA/ITA National Small College Championships and the USTA/ITA Regional Tournaments beginning in 2010. In addition, the 2010-12 USTA/ITA National Intercollegiate Indoor Championships will be hosted at the USTA Billie Jean King National Tennis Center. Baylor University announced the naming of the Hurd Tennis Building within the Baylor Tennis Center. The Hurd Tennis Building honors Mark & Paula Hurd's support of program and facilities. Mark Hurd is a former player for the Bears. The Baylor Tennis Center is a component of the Julie and Jim Turner Riverfront Athletic Park, featuring 12 outdoor courts and a clubhouse. Check out the latest schedule of USTA Campus Showdown events for juniors to play on college campuses around the country. Coaching Changes: Jamea Jackson has left the pro tour to take over as assistant women's coach at Oklahoma State University... The Shields brothers (Luke and Clancy) are now acting as assistant coaches at their former school, Boise State... Daryl Greenan left his possition at the University of Iowa to take over as the head women's coach at Mississippi State... UMBC named Oliver Steil assistant coach for both the men’s and women’s programs... Western Michigan hired Mark Henderson as assistant women's coach... Former Northwestern standout Georgia Rose joined the Illinois women's team as assistant coach...- Georgia Rose has been named assistant coach of the Illinois women's tennis team, head coach Michelle Dasso announced today. Rose, a 2009 graduate of Northwestern University, was a standout on the women's tennis team the past four seasons, helping lead the Wildcats to four straight Big Ten titles and a final national ranking of No. 2 in 2008 and 2009. TCU announced Sarah Gray as the new assistant women's coach.